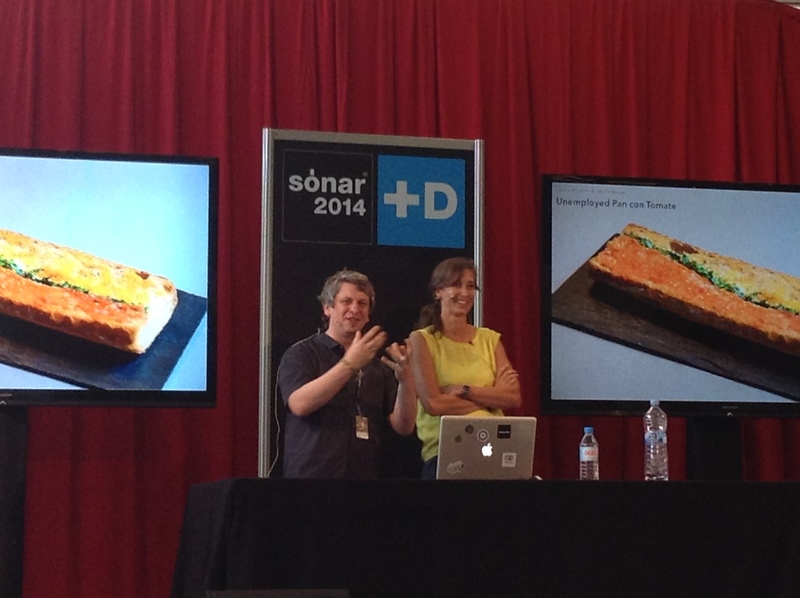 The last day of Sónar +D Creativity & Technology Conference was maybe a quieter one, with less talks and workshops. Anyway, we discovered some really interesting stuff. Data Cuisine, Helsinki-born research project by Moritz Stefaner and Susanne Jaschko, was one of the most surprising projects presented during these three days. Using food as a medium, they represent data and tell stories from the local context where food is cooked. On stage, they presented the results of a 4-day workshop done at Barcelona as part of the CCCB’s Big Bang Data exhibition. Expressing data on a physical medium beyond the screen, they managed to get our attention on important issues as the unemployement rate or the state of scientific research in our country. We missed the Friday live demo of Belgian creative studio Superbe but on Saturday we visited them at their stand at the MarketLab to know about the two products they presented at Sónar +D: Geometric Music is an app that enables to make music with sounds you record in a very intuitive fashion by using geometric forms and colors. On the other side, Minimom are Arduino-based little boxes to play with 8-bits recorded sounds. There are different models with different functions . By combining some of these little boxes you can have a physical experience and create real music. Superbe is also working on a prototype with more advanced features. When Sónar + D conference was starting to close, we even had time to attend one of the most exciting presentations of the whole festival. littleBits is a New York-based company specialized in the develoment of open-source circuit-boards with specific functions. They can be easily snapped together with tiny magnets to create more complex structures. There are several kits for different purposes, one of them being the Synth Kit developed together with the renowned Japanese musical instruments manufacturer Korg. 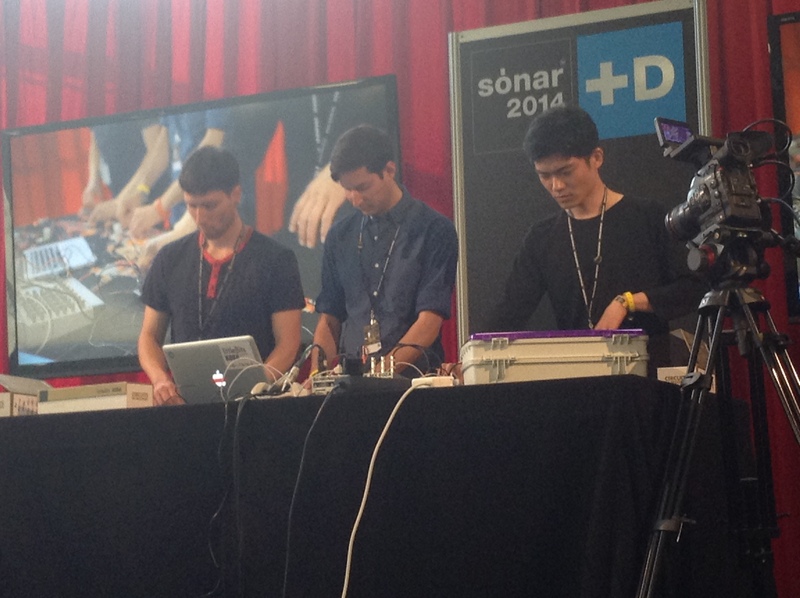 On Sónar +D stage they were represented by 3 very young guys that showed us the limitless possibilities of Open Hardware, playing a raw, intense, rhythm based set. littleBits live demo was like a perfect close for a magnificent creative tech event. Thanks so much, Sónar +D. We are already longing for the 2015 edition ! During the event, we had the chance to interview the Japanese artists/researchers Daito Manabe and Sputniko! as well as the English music Big Data specialist Chris Carey. We will publish them soon. You can follow us on Twitter to keep tuned.